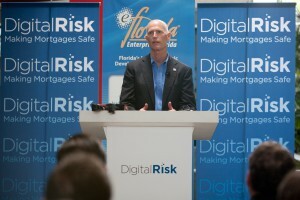 One thousand Florida jobs will result from a major expansion of Digital Risk, the nation’s largest provider of mortgage risk, compliance and transaction management solutions. Florida was selected for the expansion over four U.S. cities: Charlotte, N.C.; Dallas; Denver and Phoenix. The expansion began last month with Digital Risk’s newest site in Boca Raton, where the first 150 of the 1,000 jobs will be staffed by early September. Digital Risk acknowledged the qualified pool of employees in the Palm Beach area influenced the selection of Boca Raton. The company will focus on finding communities throughout the state to meet the remaining need. Digital Risk expanded its Florida presence in 2009, adding more staff to its headquarters operations. Since then, the company also set up operations in Jacksonville. In total, Digital Risk has created more than 1,300 new jobs in Florida since 2009. Statewide, several organizations have been vital partners to Digital Risk in its expansion efforts. Among them are Enterprise Florida, Business Development Board of Palm Beach County, City of Boca Raton, City of Jacksonville, City of Maitland, JAX USA Partnership, Metro Orlando Economic Development Commission, Workforce Florida Inc. and Orange County. Digital Risk, together with its subsidiaries, is the largest provider of mortgage risk and compliance management solutions. The company provides makers, servicers and investors the analytical, technological and risk management services they need to achieve their goals. The Digital Risk platform delivers transparency at the loan level and precise risk assessment throughout the entire mortgage life cycle. Digital Risk is privileged to serve the nation’s leading banks and investors. Digital Risk is independent and not affiliated with an originator, issuer, servicer or investor. Headquartered in Maitland, Digital Risk has additional operations in Boca Raton and Jacksonville as well as New York, Dallas and Denver.